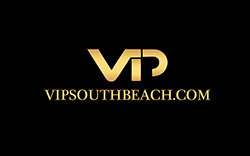 If your in the mood to shop Miami Beach has plenty of great shopping areas. Weather you are looking for the right trendy outfit for your hot night out in the South Beach nightlife scene or you just want to spend time browsing in some really nice stores, South Beach has just what you are looking for. With many designer boutiques like Kenneth Cole and the French Connection to chain store retailers like Bebe and the Gap. Here are the best shopping areas for spending the day or night shopping in South Beach. Nick named the Fifth Avenue of the South, Lincoln Road is an outdoor mall with many retail stores, unique shops and plenty of restaurants. The street is only open to pedestrians, bikes or roller blades and it is the perfect place for shopping or just browsing though interesting and unique stores. Lincoln Rd is also home to many amazing art gallery’s with top artists like Romero Britto. So weather you want to shop or just have a bite to eat or a coffee Lincoln Road is one of the best places for it and if you like people watching this is the place. 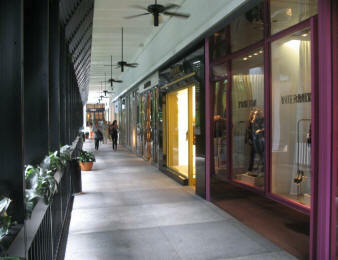 Here are a few of the different types of clothing stores on Lincoln Rd. Arden B, Lucky Brands, Victoria’s Secret, Bebe, Banana Republic, Gap, Quiksilver and many more. 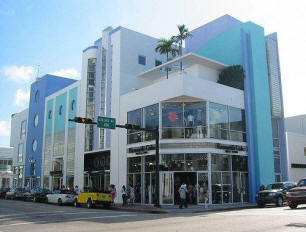 Lincoln Road is located between 16th and 17th street in South Beach. Called the designer district of Miami Beach and carrying some of the worlds most amazing designer boutiques like Diesel, Armani, Nicole Miller Kenneth Cole to name a few. Celebrity sisters Kourtney, Kim and Khloe Kardashian recently opened their LA based boutique called Dash which is a big hit in South Beach. A very unique historic street in South Beach with a very bohemian feel. Some of the building are from the 1920’s with interesting Mediterranean architecture. This street is a must see full of many cool shops, art galleries, clothing boutiques, European style cafés and restaurants. Every weekend there is a festival with live music and amazing handmade crafts.